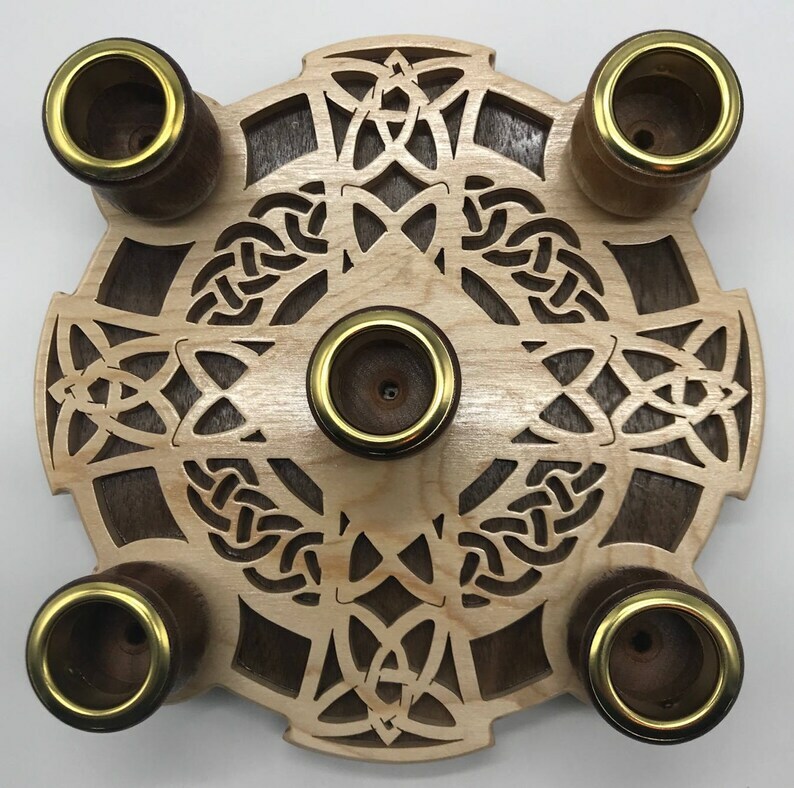 This beautiful scroll sawed Advent wreath is 7.5” in diameter and features a Celtic cross with trinity and rope designs. The overlay is ¼” maple and the backer is ½” walnut. The candle cups are walnut with brass cup rings. The wreath takes standard tapers (7/8” [nominal] base). Normally ships in 3-5 business days. candle in the center. Beginning with the First Sunday of Advent, the lighting of a candle can be accompanied by a Bible reading and prayers. An additional candle is lit during each subsequent week until, by the last Sunday before Christmas, all four candles are lit. Many Advent wreaths include a fifth, ‘Christ candle’ which is lit at Christmas Eve or Christmas Day. The custom is observed both in family settings and at public church services. Beautiful! The craftsmanship is excellent. The pictures don't do it justice. We always celebrated advent when our children were growing up. This was a gift for my now grown son so that he can continue this tradition. He was very impressed with the detail. I can see this being something would be passed down the generations. I love this wreath. I decided to add a little greenery to enhance the my new Advent Wreath.